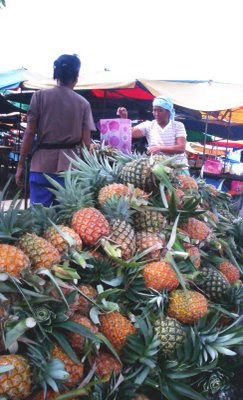 This afternoon I bought four of these beautiful pinapples ( Ananas cosmosus) at the 'tamu' or local jungle produce market. The Malay word for pineapple is 'nenas'. One fruit like the above costs RM 1-2 only, each one weighing between 1-2kilos. I bought them to make fresh juice to break my fast today.